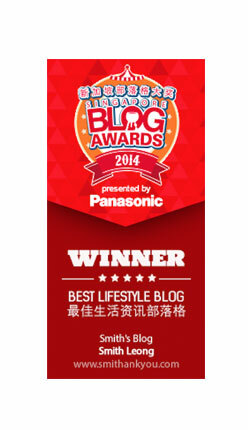 [Game Review] Restaurant City ~ Smithankyou - Lifestyle and Travel Photo Blog. 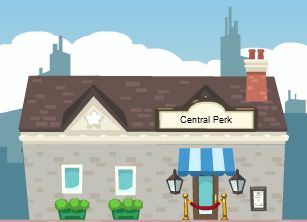 I spent most of my time on Facebook - Restaurant City !! 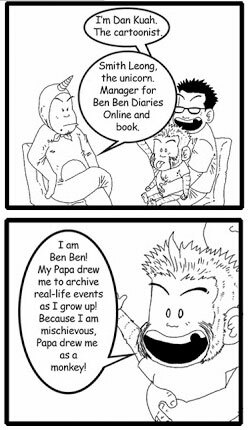 and yes.. i dun believe it !!! So what is this game about ? 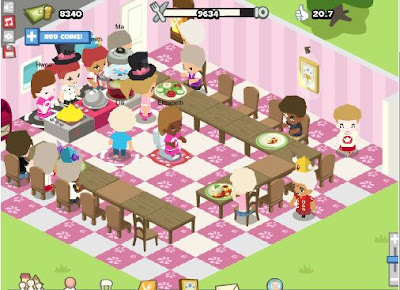 It's pretty much like Sims + Harvest moon kinda game where each of you will be given a Restaurant to run it and the interesting part comes in when it is online..I will briefly go thru with you guys what makes this game so addictive..
Everyone is given a restaurant..you can name it whatever way u like it.. and it is seriously up to you to dress it up..
or u can just choose NOT to dress it up..And give it a random name as well..
and some even do it with thematic style ! Of course.. all this comes with a little price.. MONEY ! 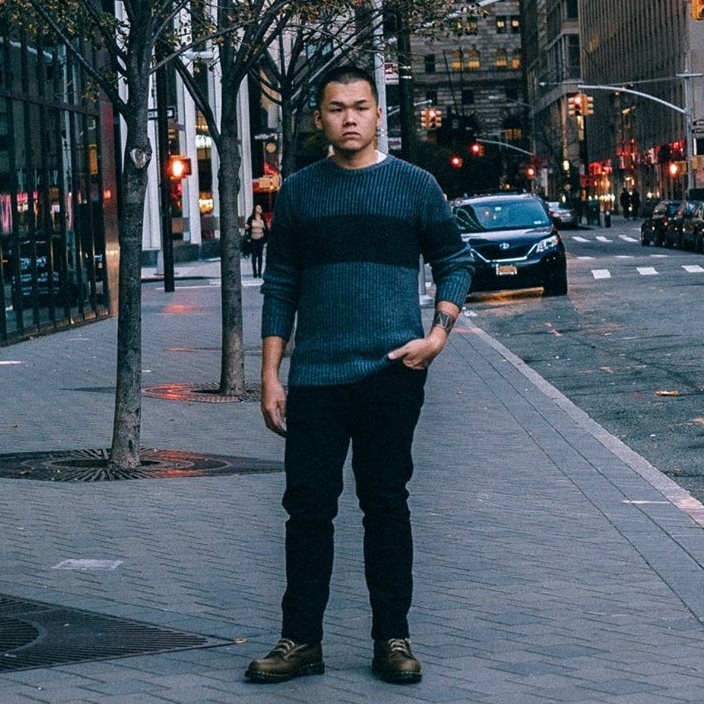 So how do you earn money ? as the game suggest, sell food of course ! Let's take a look at how it looks inside.. 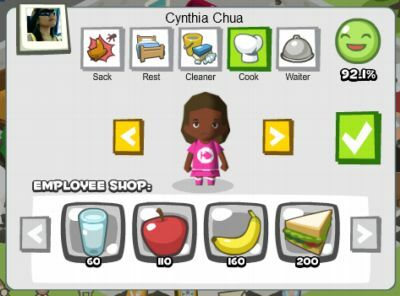 So the basic element for you to earn money is, food,staff,tables and as the games go higher level u will require more things like toilet and staff..
you will also level up your restaurant and earn bonus like being able to hire more stuff ( yes.. there is a limit according to your level) as well as bigger shop space..
let's go down their key functions button and let me explain briefing to you what's all this abt.. The street button very much takes you to the street where you can see ur friend's shop and go into them and trade items..
Point to note : when u go INTO their shop and look around..they cannot physically see you walking into their shop at the same point of time.. so DO NOT pm them and ask " hey.. i am in ur shop now.. do u see me ? " Dress yourself, very much one of the element in many online game which keep pple earning money to make themself looks good, avatar and stuff..but all this item does not have attributes.. wearing nicer dun make u a better waiter and attract more crowd.. so ladies.. keep the clevage below the clothes..
u can choose everything from eyes to clothing to head set.. all for a little price..
or u can choose to spent 0, wear default clothing and even ur skin color to look like albino kid..
but of course.. if u hire a friend into ur shop and work u will realize something interesting.. 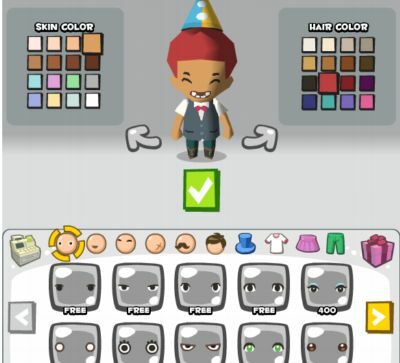 If your friend plays this game as well.. ur avatar of him in ur shop will be updated according to what he purchase for himself as well.. but if ur friend ain't a RC player.. very likely ur friend is default.. and might look like some maid..
And as u can see from the above screen.. u need to feed ur staff OR let them rest.. either one will do the job.. u can choose to feed them with water and they can work for another 25%.. oh u are asking what is this % thing ? it's their health in a way where u have to kip them alive.. they will work slower as the % goes lower and they will stop working if they hit 0%.. yes yes keong and christie.. we sell our lobster @ $2 per plate and we have to pay $60 for a cup of water for our staff..
and basically there is 3 jobscope one staff can pick up.. a cook, a cleaner and a waiter.. The redecorate button : it allows u to shift ur furniture in the shop tactically.. When i say tactically it means like allowing ur customer to have proper table and chair..not making ur staff running around too much.. all this does makes a different.. And yes keong..1 table is to 1 chair.. pple in restaurant city DO NOT SHARE !!hahaha.. but of course there are some shops which aint that tactically..
and then is the change menu button ! 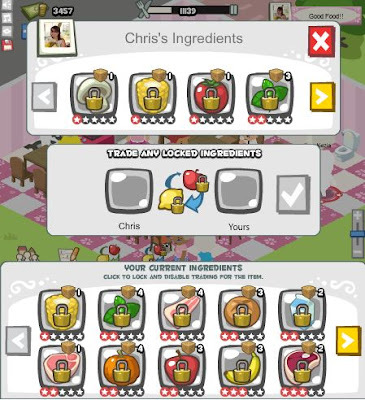 This is the main gins of the game..u get food ingredient to piece up according to the menu and everytime u sell some food u earn points to level up ur restaurant..
1. Daily Freebies : u will get 1 free food a day..
3. 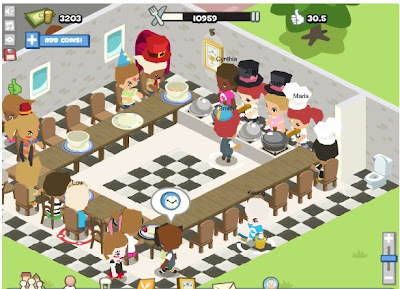 Go into a new friend's restaurant to earn food.. but this is a once per friend thing.. so is either u make more of ur friends join the game or u go out there and find pple who are playing this game and add them as friend.. either way works.. So if u have alot of ingredient but they ain't the kind u need ?? 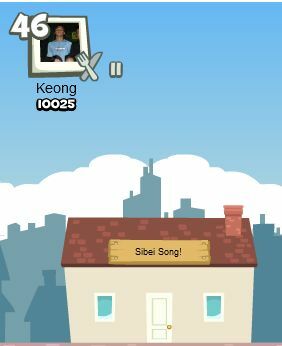 U will hit the street and go to different friend's restaurant to do trade like the screen above.. sorry u cant give away food.. u can only exchange 1 for 1.. this is the part which makes everyone go " I need Egg !! i need pork!! " 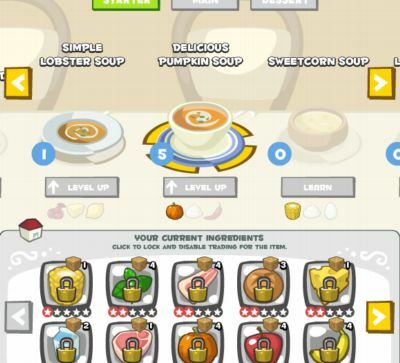 basically u will need at least 3 kind of ingredient to form up 1 dish..
And yes.. each plate of food goes at $2 regardless of what indregient.. be it lobster,apple or rice.. and level dun make ur food more expensive.. it just allows u to earn more points !! Mail box where u can communicate with ur friends.. 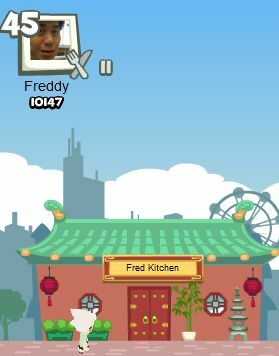 So this is a very very simple game where u dun think too much to play... a more expensive stove dun make them cook faster.. a better looking restaurant doesn't attract more crowd..
now u have read it.. try it !! 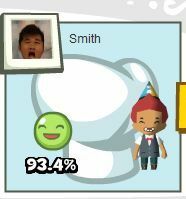 Mr.Smith, This game is amazingly addictive.. trust me.. try it to know it..